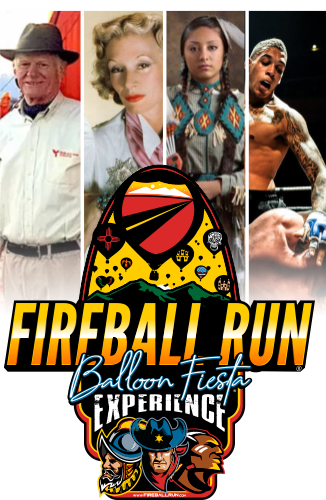 Fireball Run 'Balloon Fiesta'® Experience® is a 6-day, 5-night, beyond VIP 'driventure' enhanced with immersive, historic, cultural, and culinary experiences. All leading up to your personal participation in the world's biggest ballooning event. Forget touring and start doing. Venturing with Fireball Run means unprecedented access, personal treatment, historic opportunities, and seriously immersive experiences. Vacations are for tourists. Tours are too tame. Extreme adventures aren't exclusive. What differentiates us from others isn't the location- it's what you'll do when you get there. Fireball Run: 'Balloon Fiesta' Experience takes place entirely in New Mexico. Participation is exclusive and limited to just 15, two-person adult adventourists. Get exotic, go in style, or drive in comfort... any personal vehicle is acceptible in this adventure. Below are the places you'll go, people you'll meet, and rare moments you'll experience. Expect to interact with world history and rediscover lost history in ways never dreamed possible. This isn't a tour- it's an adventour. Although we expedition in extraordinary ways, everyone is encouraged to embark on your own ultimate drivecation to these endorsed locations. Tap icons to reveal what sets this journey apart from the ordinary. 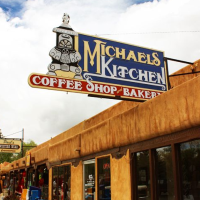 Considered one of the best restaurants in town, Michael’s Kitchen has been in business since 1974, and some original staff members remain. 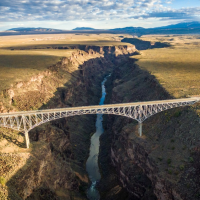 Locally known as the "Gorge Bridge" or the "High Bridge", is a steel deck arch bridge across the Rio Grande Gorge 10 miles northwest of Taos, New Mexico, United States. Roughly 600’ above the Rio Grande, it is the tenth highest bridge in the United States. An Open Book of Human History Bandelier National Monument protects over 33,000 acres of rugged but beautiful canyon and mesa country as well as evidence of a human presence here going back over 11,000 years. Petroglyphs, dwellings carved into the soft rock cliffs, and standing masonry walls pay tribute to the early days of a culture that still survives in the surrounding communities. an all-inclusive film location nestled in the foothills of northern New Mexico. The ranch is spread out over several thousands of acres and features over 2 pounds, one movie town, and 2 home sets. More than 130 movies, as well as various videos, commercials and catalog shoots, have been filmed here! The ranch is also available for private parties, corporate retreats, and classroom visits. Dinner: Beer Creek Brewing Co.
A New Brewery and Pizza Experience brought to you by a community of people whose drive and inspiration for beer and pizza is second only to their drive and inspiration for each other. With classic architecture inspired by Taos Pueblo, this high-end hotel next to historic Loretto Chapel is 2 blocks from Santa Fe Plaza and 3 blocks from the galleries on Canyon Road. The refined rooms and suites feature dramatic Native American-style decor as well as flat-screens, coffeemakers and Wi-Fi access. Rooms with balconies and kiva fireplaces are also available. The Scaramanaga Ranch is a privately owned majestic 25-acre production ranch & film site with uninterrupted sunrise to sunset views, dynamic elevations and diverse terrain. Scaramanga Ranch is named in tribute to infamous James Bond villain... Francisco Scaramanga- The Man With The Golden Gun. Superior views above the quirky artist village of Madrid, NM along the Turquoise Trail (NM HWY-14). Located within the La Fonda Hotel, La Plazuela isn't just a place for dinner, it boasts as one of the areas best for an authentic New Mexican breakfast. La Plazuela flavor is a tasty the beginners course of your 5-day cuisine journey. La Fonda on the Plaza is a historical luxury hotel in downtown Santa Fe, NM. La Fonda means "the inn". The hotel has been described as "the grand damn of Santa Fe's Historic hotels." Opened December 20, 1922. Exquisite art, decor, history, and modern amenities. La Fonda is an experience onto itself. 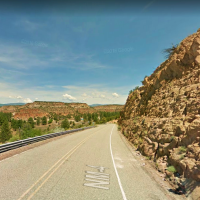 This epic drive from Santa Fe to Taos via Hwy 84 into Espanola, NM and onto NM-Hwy 68 following the Rio Grande through Velarde, Pilar, and Dixon, NM. While this is the most direct drive it is also very scenic along the Rio Grande via Tierra Amarilla Canyon. Located within the La Fonda Hotel, fresh and flavorful, La Plazuela takes an innovative approach to New Mexican cuisine, cooking up traditional recipes with an enticing new twist. Take a seat at La Plazuela restaurant, an warm space built in the 1920's that sits below a dramatic, wrought-iron chandelier and lofty foliage, all encircled by hand-painted windows, evoking the style of the Southwest. Nestled in the heart of La Fonda on the Plaza, is the most intimate among restaurants in Santa Fe. The Santa Fe Plaza is a National Historic Landmark in downtown Santa Fe, New Mexico in the style of traditional Spanish-American colonial cities. The plaza, or "city-square", was originally, and is still to this day, the center gathering place in town. The landmark has since grown into a time-capsule of Spanish, Native American, and Mexican cultures, music, design, jewelry, art and dance. Known to locals simply as the "Plaza," it is a living epicenter of Native American, Spanish, Mexican, and American history. Come face to face with the rich and diverse heritage of the American Southwest at the Millicent Rogers Museum the highlight of the museum is the magnificent turquoise jewelry collected and owned by fashionista Millicent Rogers for whom the museum is named. Her collection includes the famous "Tab Necklace" that she purchased for $5000 in the 1940s. Balloon Fiesta "Behind the Scenes"
Mandatory attendance required. Gathering between guests and guides to review the itinerary, what to expect, artifact engagement guidelines, as well as safety protocol. To maintain the quality and rare nature of this experience. Casual guest gathering at La Fonda Hotel. Meet, drink, and enjoy 4-star amenities. La Fiesta Lounge isn't just for hotel guests, it's the social gathering place of the states most influential personalities. Two visionary painters, whose art captured the Southwest. Explore the studios of E. I. Couse and J. H. Sharp, founding members of the Taos Society of Artists. These two painters helped create the cultural fabric of Taos and the West as we know it today. Visit the Couse home and see how these pioneer painters lived. Stand at Couse’s easel, see the model’s stage and props. All remains as it was 100 years ago. Museum in the preserved Spanish colonial style home of the frontier expedition leader built in 1825 "This adobe house, built around 1825, is the original home of the renowned pioneer frontiersman and his wife, Josefa. The beautiful courtyard is a lovely destination with its forest of hollyhocks and other flowers nestled in the heart of historic Taos." a design cooperative committed to the uncompromising reproduction of New Mexican arts and crafts from their classic periods. Under one roof, our artisans are bringing back exquisite examples that will enhance your understanding and appreciation of the rich visual tapestry that was once historical New Mexico. Set across several adobe houses dating from the 1800s, this landmark inn is a 2-minute walk from the Kit Carson Home and Museum, and 3 minutes from Taos Plaza. Relaxed rooms and suites, all with free Wi-Fi, feature details such as hand-carved doors, wood-burning or gas fireplaces, viga ceilings, and antique furnishings. a 501(c)3 organization in the Albuquerque Rail Yards dedicated to collecting, preserving and creating educational exhibits about the history of transportation in Albuquerque and New Mexico with emphasis on the impact on the development of the area. Our collections embrace the history of the railroads, the impact of the rail yards on Albuquerque, as well as automobiles, horse and wagon, and other modes of transportation. an acclaimed dining establishment located in a registered historic landmark. A Taos tradition, the restaurant has earned multiple awards for its fabulous regional New American fare. The Santa Fe Plaza is a National Historic Landmark in downtown Santa Fe, New Mexico in the style of traditional Spanish-American colonial cities. The plaza, or "city-square", was originally, and is still to this day, the center gathering place in town. Many know it as "the heart of Santa Fe"
Fondly called 'the living room of Taos' by locals and visitors alike, The Adobe Bar is the place to be. An animal conservation museum located in Old Town Albuquerque. The museum is devoted to snakes, particularly rattlesnakes, and is dedicated to rattlesnake education. Balloon Fiesta "Special Shapes Glowdeo"
Relax while enjoying a top-shelf margarita or sampling a tequila flight while sharing plates of our tempting comfort food at our vibrant dining and gathering spot. Sit on the patio for spectacular sunset views of the Sandia Mountains. Yeah it's a lot and you'll enjoy every bit of it. At each site you'll be personally greated by either it's owner, executive director, or senior curator. Day DAY 1 10/09 DAY 2 10/10 DAY 3 10/11 DAY 4 10/12 DAY 5 10/13 DAY 6 10/14 Sort by experience day. Within a week or so of the experience return here for an array of complimentary images all featuring you. Our insanely talented still photographers from the series will capturie every candid moment of your adventure. This Adventour is SOLD OUT! Email FBRExperiences@Gmail.com to get on the cancellation list. Event creation inclusive of all advanced logistics.